Derbent (Russian: Дербе́нт; Azeri: Dərbənd; Lezgian: Дербент; Avar: Дербенд; Persian: دربند, Darband) is a city in the Republic of Dagestan, Russia. It is the southernmost city in Russia and one of the most important cities of Dagestan. Often identified with the legendary Gates of Alexander, Derbent claims the title as the oldest city in the Russian Federation. Since antiquity, the area has been valued as the gate to the Caucasus, and Derbent has structures over 5,000 years old. The city developed in the narrow gap between the Caspian Sea and the Caucasus Mountains. Originally established as a fortress to guard the principal caravan route from southwestern Europe to Southwest Asia, it served this purpose for 1,500 years, longer than any other fortress in the world. Over the years, different nations gave the city different names, but all names were connected to the word "gate." Many of the city's ancient monuments survive, and are included in the World Heritage Site designation inscribed by UNESCO in 2003. 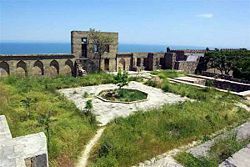 The Citadel, Ancient City, and Fortress Buildings of Derbent are included in the inscription, based upon the vital role they played throughout fifteen centuries of history. The name Derbent derives from the Persian darband, meaning closed gate. It was known to the Arabs as Bāb al Abwab, or Gate of Gates, and to the Turks as Demirkapı, or Iron Gate. The modern city is built near the western shores of the Caspian Sea, south of the Rubas River, on the slopes of the Tabasaran mountains (part of the Bigger Caucasus range). The city is hot and dry in the summer but the winters are hard in the mountain areas. The average maximum daytime temperature in January 35.6°F (2°C) and around 86°F (30°C) in July. Rainfall in the interior mountainous areas averages 20–30 inches (510–760 mm) annually, while rainfall in hot and dry north is with only 8–10 inches (200–250mm). The area surrounding the Caspian Sea is considered one of the most ecologically devastated environments in the world because of severe air, soil, and water pollution; soil pollution results from oil spills, from the use of DDT as a pesticide, and from toxic defoliants used in the production of cotton. View on the Caspian Sea. 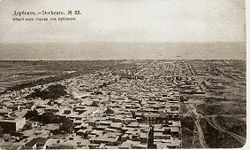 View of the city from Naryn-Kala, 1910. Derbent has an important strategic location in the Caucasus. Its position on a narrow, three-kilometer strip of land between the Caspian Sea and the Caucasus mountains allowed the rulers of Derbent to control land traffic between the Eurasian Steppe and the Middle East. The only other practicable crossing of the Caucasus ridge was over the Darial Gorge. The first intensive settlement in the Derbent area dates from the eighth century B.C.E. The site was intermittently controlled by the Persian monarchs, starting from the sixth century B.C.E. Until the fourth century C.E., it was part of Caucasian Albania, and is traditionally identified with Albana, the capital. The Persian word (دربند Darband), meaning "closed gates," came into use as the name for the settlement at the end of the fifth or the beginning of the sixth century C.E., when the city was refounded by Kavadh I (449-531) of the Sassanid dynasty of Persia. The 30 meter high walls with 30 north-looking towers are believed to belong to the time of Kavadh's son, Khosrau I of Persia, who ruled from 531 to 579. The Armenian chronicler Movses Kagankatvatsi wrote about "the wondrous walls, for whose construction the Persian kings exhausted our country, recruiting architects and collecting building materials with a view of constructing a great edifice stretching between the Caucasus Mountains and the Great Eastern Sea." Derbent became a strong military outpost and harbor of the Sassanid empire. During the fifth and sixth centuries, Derbent becomes also an important center for spreading the Christian faith in the Caucasus. Movses Kagankatvatsi left a graphic description of the sack of Derbent by the hordes of Tong Yabghu of the Western Turkic Khaganate in 627. His successor, Buri-sad, proved unable to consolidate Tong Yabghu's conquests, and the city was retaken by the Persians. In 654, Derbent was captured by the Arabs, who transformed it in an important administrative center and introduced Islam to the area. 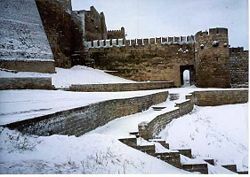 Because of its strategic position on the northern branch of the Silk Road, the fortress was contested by the Khazars in the course of the Khazar-Arab Wars. Excavations on the eastern side of the Caspian Sea opposite to Derbent have revealed the eastern counterpart to the wall and fortifications of the city in the Great Wall of Gorgan, located in the Gorgan region of northeastern Iran, in antiquity known as Hyrcania. Similar Sasanian defensive fortifications—massive forts, garrison towns, long walls—are seen on the eastern shores of the Caspian extending literally into the sea as they are seen emerging from the rising waters of the Caspian in the west at Derbent. 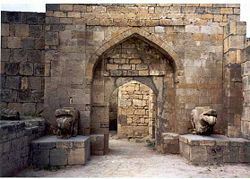 The Caliph Harun al-Rashid (763-809) spent time living in Derbent, and brought it into great repute as a seat of the arts and commerce. According to Arab historians, Derbent, with a population exceeding 50,000, was the largest city of the ninth century Caucasus. In the tenth century, with the collapse of the Arab Caliphate, Derbent became the capital of an emirate. This emirate often fought losing wars with the neighboring Christian state of Sarir, allowing Sarir to occasionally manipulate Derbent politics. Despite that, the emirate outlived its rival and continued to flourish at the time of the Mongol invasion in 1239. In the fourteenth century Derbent was occupied by Tamerlane's armies. In 1437, it fell under the control of the Shirvanshahs of Persia. 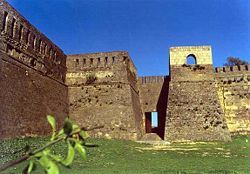 During the sixteenth century, Derbent was the arena for wars between Turkey and Persia ruled by the Persian Safavid dynasty. By the early 17th century the Safavid Shah Abbas I inflicted a serious defeat on the Turks and recovered Derbent, which had been a part of Persia for centuries previous. By the 1735 Ganja treaty, Derbent fell within the Persian state. In 1722, during the Russo-Persian War, Peter the Great of Russia wrested the town from the Persians, but in 1736 the supremacy of Nadir Shah (1698-1747) was again recognized. In 1747, Derbent became the capital of the khanate of the same name. During the Persian Expedition of 1796 it was stormed by Russian forces under Valerian Zubov. As a consequence of the Treaty of Gulistan of 1813—between Russian and Persia—Derbent became part of the Russian Empire. The region was embroiled in Caucasian Wars from 1817–1864, also known as the Russian conquest of the Caucasus, until Avar political and religious leader Imam Shamil (1797-1871) was captured in 1864. In the Russo-Turkish War (1877-1878), Dagestan and Chechnya rose against Imperial Russia for the last time. During the Russian Civil War (1917-1922), the region became part of the Republic of the Mountaineers of the North Caucasus (1917–1920). The Dagestan Autonomous Soviet Socialist Republic (ASSR) was proclaimed on January 20, 1921. Soviet rule was slow to become established. A national resistance movement remained active until the 1930s, instigating uprisings in the autumn of 1920 and a second in the spring of 1930. The nationalist movement was crushed during the process of collectivization in the mid-1930s. After World War II, the suppression of the mountain people continued through the educational system and Soviet cultural policy. Since the Soviet Union collapsed, Dagestani Muslims, who combine Sufism with local tradition, have tried to avoid the conflict that has afflicted Chechnya. But in the late 1990s, more radical and militant elements, linked with Wahhabism, gained influence. Chechen warlords led armed operations in Dagestan, first in 1995 and 1996, when Shamil Basayev and Salman Raduyev crossed the border and seized hundreds of hostages in hospitals in the Dagestani towns of Budennovsk and Kizlyar. Since 2000, the republic has sustained numerous bombings targeted at the Russian military. In 2003, UNESCO classified the citadel, ancient city, and fortress as a World Heritage Site. 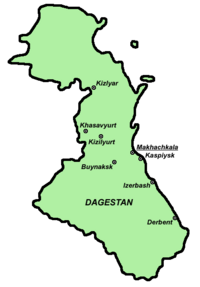 Map of Dagestan; Derbent is the most southern city noted, on the eastern border. In 2007, the Republic of Dagestan was one of the 21 republics of the Russian Federation. Dagestan's highest executive authority lies with the State Council, comprising representatives of 14 ethnicities. The members of the State Council are appointed by the Constitutional Assembly of Dagestan for a term of four years. The chairman of the State Council was the highest executive post in the republic. The People's Assembly consists of 121 deputies elected for a four-year term. 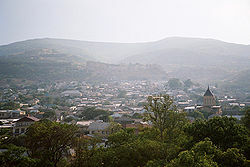 Derbent is one of Dagestans's 10 cities and towns. The republic has 41 districts, 19 urban settlements, 694 selsoviets (administrative unit), 1605 rural localities, and 46 uninhabited rural localities. Agriculture is Dagestan's largest economic sector, involving more than one third (35 percent) of the economy. Livestock raising is the main activity, especially sheep farming. Only 15 percent of the land is cultivable. Many agricultural areas are terraced into hillsides. Fishing is an important industry along the Caspian Sea coast. The Caspian is the source of what is considered the finest caviar in the world. Dagestan's most important industries are petroleum and natural gas resources on the coastal plain near the capital Makhachkala, and Izberbash, although Derbent also has such deposits. Derbent is home to machine building, textiles, fishing, fishery supplies, and has a large cannery. It is known for construction materials and wood industries, and wine making. It is the production center of Russian brandy. Derbent is well served by transportation, with an international harbor, a railway line south to Baku, and the Baku to Rostov-on-Don [highway]]. 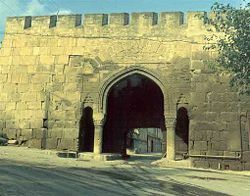 A gate in the old city of Derbent. The population of Derbent was 101,031 in the 2002 Russian Census. The Derbent district is home to a sizeable Azeri community. The Azeris are the main ethnic group, followed by Lezgins and Tabasarans. Russian is the lingua franca, though before the 1917 revolution it was Arabic. Each of Dagestan's 33 ethnic groups has its own distinct language. The three main linguistic groups are Turkic, Persian, and aboriginal Caucasian. Dagestan has been long known as a religious area. Before the 1917 revolution, Dagestan had 1700 ordinary mosques, 356 cathedral mosques, 766 Qu'ranic schools (madrassahs), and more than 2500 mullahs. During the Soviet era, most mosques were closed, and the mullahs harassed. Dagestan underwent an Islamic renaissance during the 1990s. International Eastern University is located in Derbent, as are several technical schools. A gate of the citadel. To the north of the town is the monument of the Kirk-lar, or 40 heroes, who fell defending Dagestan against the Arabs in 728. Derbent has a Lezgin (a Dagestani ethnic group) drama theater, the S. Stalsky Theatre. About two kilometers from the city is the vacation colony of Chayka (Seagull). As a World Heritage Site, Derbent has numerous ancient structures of interest. 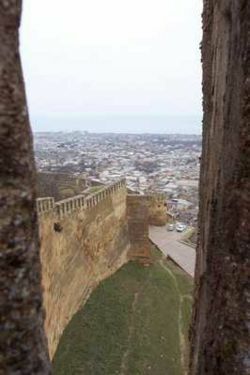 To the south of Derbent lies the seaward extremity of the Caucasian wall, which is 164 feet (50 meters long), otherwise known as Alexander's Wall, blocking the narrow pass of the Iron Gate or Caspian Gates (Portae Athanae or Portae Caspiae). The entire structure had a height of 29 feet (nine meters), and a thickness of about 10 feet (three meters), and with its iron gates and numerous watch-towers formed a valuable defense of the Persian frontier. The city has a well preserved citadel (Narin-kala), comprising an area of 45,000 m², enclosed by strong walls. There are the old baths, the cisterns, the old cemeteries, the caravanserai, the eighteenth century Khan's mausoleum. Several mosques include the Juma Mosque, built over a sixth century Christian basilica, the seventeenth century Kyrhlyar mosque, the Bala mosque, and the eighteenth century Chertebe mosque. There is also a fifteenth century madrassa. Derbent is like a huge museum and with magnificent mountains and seashore nearby. The potential for development of tourism exists, enhanced by UNESCO's classification of the citadel, ancient city, and fortress as a World Heritage Site. However, instability in the region from the late 1990s from radical Islamists linked with Wahhabism has hindered economic progress. Some text used with permission from www.travel-images.com. The original text can be found here. Avtorkhanov, Abdurakhman, and Marie Broxup. 1992. The North Caucasus Barrier: The Russian Advance Towards the Muslim World. New York: St. Martin's Press. ISBN 9780312075750. Beliaev, Edward, and Oksana Buranbaeva. 2006. Dagestan. New York: Marshall Cavendish Benchmark. ISBN 9780761420156. Blandy, Charles. 2006. Dagestan: Birth of Presidential Republic. Camberley, Surrey: Defence Academy of the United Kingdom, Conflict Studies Research Centre. ISBN 9781905058709. Kazem-Bek, Aleksandr. 1851. Derbend-Nâmeh, or, The History of Derbend. St. Petersburg: Printed for the Imperial Academy of Sciences. OCLC 58665611. Small Towns of Russia. Derbent. Retrieved September 13, 2008. This page was last modified on 26 October 2017, at 15:22.